Next Up: Is Parental Frowning Scarring Kids?! Continuing my look at b.s. stories aimed at provoking parents' angst, today's NYT "Thursday Styles" takes time off from obsessing about high-end retail to explore the disturbing trend in parental yelling. 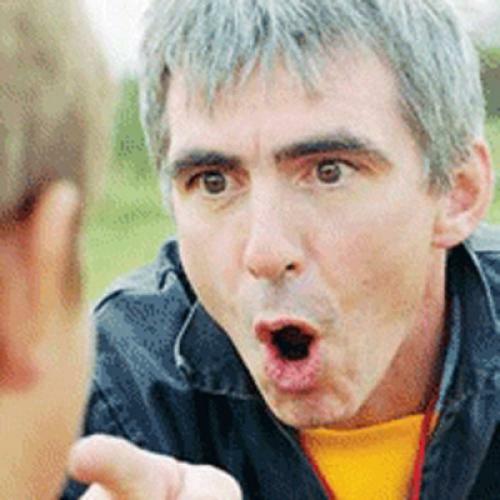 The piece suggests that, deprived of the outlet of spanking, frustrated parents are increasingly turning to yelling to discipline their kids. As one parenting expert is ominously quoted, "yelling is the new spanking." Afterwards, many mommies and daddies feel bad about all the shouting. Also suggested is that yelling may eventually prove to be just as detrimental to little pscyhes as a good whalloping. Even the requisite anti-screaming quotes from child development experts don't offer anything more than some vague cautions that yelling can damage a child's self-esteem or "be perceived as a sign of rejection." Indeed, the only damage we are shown proof of is the guilt and feelings of failure from hand-wringing parents who simply don't understand why they can't raise their children with the whole-grain goodness and invariably mild tones preached by all the parenting books. Am I going to lose sleep over this or seek the services of some high-paid parenting guru? No. Will my children wind up in therapy? Maybe. But if so, it's almost certainly because they live with parents--and in a culture--who overwhemlingly treat them like weirdly fragile hothouse flowers than because I occasionally lose my equanimity when my 6-year-old comes close to impaling his own eyeball with the utility scissors he has been told not to run with at least 15,000 times!!!! Parenting is rough, grinding work. Nerves fray. Patience is exhausted. Mommies and Daddies occasionally raise their voices. This is not news. And it's sure as hell not an ominous new trend. "Thursday Styles" should do all of us parents a favor and stick to analyzing hem lines.